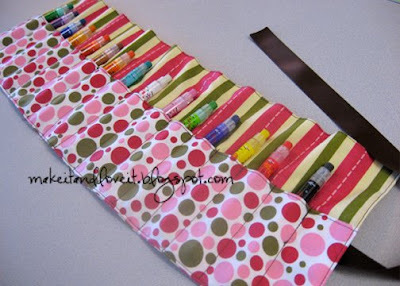 I have been looking for a crayon roll/holder tutorial but can’t seem to find one. I have found plenty of these little holders for sale but no directions. So here is my version. And if anyone finds/has other instructions, let me know and we can link them. **These instructions were created for my daughter’s long erasable crayons that are almost twice as long as a standard crayon. It will also fit pencils, pens and colored pencils. If you want one for regular crayons, keep in mind that you’ll need to make the height measurements a bit smaller. 1 piece of ribbon – 20 inches long, give or take. **All seams are to be made at 1/2 inch. And then fold them in half, lengthwise. Iron them flat. Then on the smaller piece of fabric, make a seam right along the fold, close to the edge. Then open up the larger piece of fabric and lay the smaller one on top, matching the two raw edges of the smaller one with the one raw edge of the bigger piece. Sew along that long (21 inch) edge. Then fold the other half of the larger piece over the smaller piece that you just attached…… and pin it along the long edge and the 2 sides. (You’ll be folding it temporarily in half right where you previously ironed the fold on the big piece, but the opposite way.) So now you have 4 raw edges pinned all together. Sew along all 3 sides (not the fold) leaving a 4 inch gap at the bottom, so that you can turn it right side out. Trim all 4 corners before you turn it right side out. Turn it right side out and iron it flat. Now sew around the entire thing, very close to the edge. Sew each line just until the edge of the top piece. Lastly, turn the crayon roll over and pin the ribbon to the back. Line it up to be sewn with the seam of the last compartment. Don’t sew in the middle of a compartment…….or you won’t be able to slide your crayon in there. Stick your crayons in and roll it up. Now let your little one have at it. Half the fun for toddlers is sliding the crayons in and out. Hey, whatever works. Keeps them busy. super cute! I think I am going to make this tonight to have for church tomorrow! I’m a somewhat new follower to your blog and I LOVE IT! I found directions a while ago for this on skiptomylou.org (great blog, you’d love it). I made one of these out of felt too. Not quite as cute as the printed fabrics, but way fast and easy. 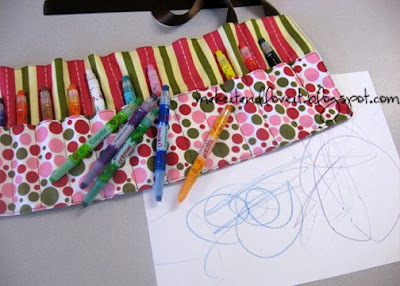 I just happened upon a tutorial for a crayon roll on this site: http://www.skiptomylou.org. Random! Thanks for the motivation to make something fun! And then I read the comment above mine and saw that she already told you! It’s like speaking before you think, just an online version! Oh well! Thanks for the link, both of you! I also saw a tutorial on chocolate on my cranium dot blogspot….I think it’s very similar to skip to my lou’s. Cute stuff! I wanted to tell you I made two of the crayon rolls…I think you would be proud…Im just learnig to sew and so I am using a lot of your projects to teach me…I wish I knew how to post a pic but I dont…bum deal!!! Hey again…I was looking at your blog thing and I saw that it said you lived in Idaho…what part? I live in Idaho too. Your website is very inspiring. Love your site and thanks again. I've been looking for clear directions for a while now! I'm no dummy, but I couldn't for the life of me figure out the directions on any of the other blogs out there. Hi, I found this tutorial yesterday and made a crayon roll for my niece. Check it out on my blog if you like. I made a few adjustments to it to fit my needs. I didn't fold the bigger piece of fabric due the print that I decided to use. Didn't want it to be upside down. I also used interfacing to reinforce it a little bit. I hope you like my handiwork. Just made one of these. I made it for regular sized crayons. I was kind of in a hurry so I didn't measure out the slots. Instead I just stuck a crayon in and sewed the line. It ended up fitting 16 crayons (exactly how many I needed) perfectly. I love how it turned out. Thanks for posting this project. I've seen these online, but never gave much thought to them until my niece whipped one out of her diaper bag for her 2 year old in a restaurant last week. He enjoyed putting them back into the carrier as much as he loved having his own crayons in his frog wrapper! I was amazed and intrigued! I shall use your tutorial to create them for all the toddlers on my gift lists!! Thank you so much! I may try to adapt this for crochet hooks or knitting needles! I just made the crayon roll, the directions were awesome! I just made homemade bias tape as I didn't have ribbon and was in a mood to be frugal. I also didn't pin for each crayon slot, but rather used my ruler and a washable fabric marker…much easier to be accurate. Thanks so much for this fantastic tutorial. It's by far the qucikest and easiest one of these I've seen. You saved my bacon! I just knocked up three of these in about 90 minutes. Thanks again. You're aa legend. I'll be making heaps of things from your blog ! I just made the crayon roll, and it was so easy! I don't sew well, but it turned out so cute, better than I expected with my limited sewing skills. Thanks a bunch! thank you so much for this tutorial! Your instructions were very clear and I made this in about 20 mins!!! Thanks again! Thanks! I just made my first of 5 for the kiddos on my Christmas list! I'm measuring my fabric 18" wide and that's pretty much perfect for 16 1" slots for crayons. Also using disappearing fabric pen for the slots. I have to admit, it's taking me quite a bit longer than everyone else! Maybe I'm overthinking it! I’m going to make one for all my nieces and nephews and kids for Christmas! Thanks for all the great tutorials! Can you use flannel fabric or is that too thick? This can also be used to make a toy car (i.e. Hotwheels, Matchbox, etc) carry-holder. Use the same concept except measure larger pockets for the cars. The larger portion of fabric for the backing can be embroidered too before sewing it to the pocket section. hi- bought a few of these on ETSY to study & give away. (Crayons can be free at most restaurants!). As a gramma, they are perfect altho I have no little grands. your tutorial is easy to follow and i have SO much fabric, I better stop writing and get a kickin’! I have been looking for a pattern for this. I make bobbin lace and wanted to make a roll up case for my wound bobbins. I have a case that I bought years ago, but as I’m not good at sewing, I couldn’t reverse engineer it! I’m so excited to find your tutorial. After I make a few for my bobbins, then I can make one for my crochet hooks! !